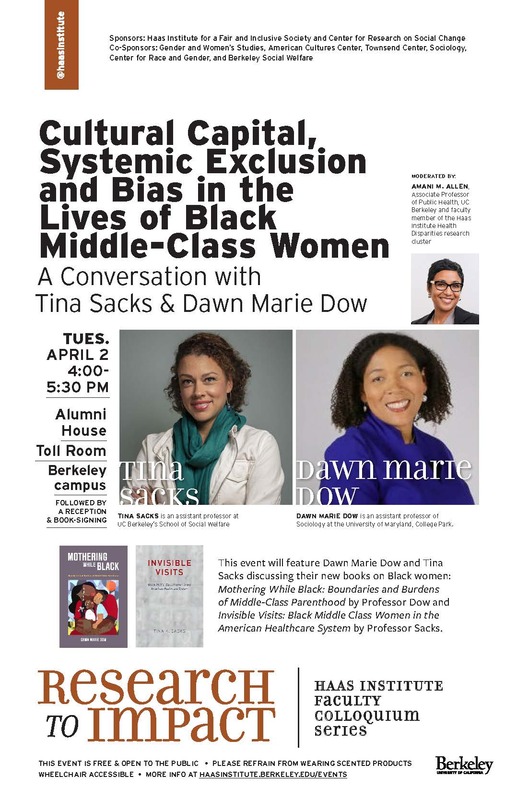 Description: At this interactive event, Dawn Dow and Tina Sacks will discuss their new books on African American women. Dow’s book, Mothering While Black: Boundaries and Burdens of Middle-Class Parenthood (UC Press 2019), examines the complex lives of the African American middle class—in particular, black mothers and the strategies they use to raise their children to maintain class status while simultaneously defining and protecting their children’s “authentically black” identities. The book reveals the painful truth of the decisions that black mothers must make to ensure the safety, well-being, and future prospects of their children. In her book Invisible Visits: Black Middle Class Women in the American Healthcare System (Oxford University Press 2019), Sacks challenges the idea that race and gender discrimination - particularly in healthcare settings - is a thing of the past and questions the persistent myth that discrimination only affects poor racial minorities. She argues that simply providing more cultural-competency or anti-bias training to doctors will not be enough to overcome the problem. Rather than lecture, Dow and Sacks will serve as each other’s interlocutors, as well as engage with the audience, as they center the experiences of middle class African American women. Tina Sacks is an assistant professor at UC Berkeley's School of Social Welfare. Her fields of interest include racial inequities in health, social determinants of health, and poverty and inequality. Her work focuses on how macro-structural forces, including structural discrimination and immigration, affect women's health. Her current work investigates the persistence of racial and gender discrimination in health care settings among racial/ethnic minorities who are not poor. Dawn Marie Dow is an assistant professor of Sociology at the University of Maryland, College Park. Her research examines intersections of race, class and gender within the context of the family, the workplace, educational settings and the law, and how these intersections complicate long-standing debates regarding the relative influence of economic and cultural resources on the experiences and life trajectories of members of the expanding African American middle and upper-middle-class.